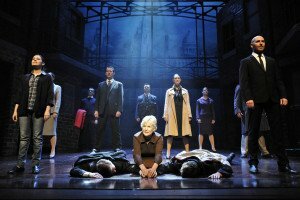 Hello Lyn, thanks for joining me today, and welcome back to Blood Brothers! It must be like greeting an old friend! LP: It certainly is! Oh my goodness, it’s two and a half years since I last did it, so yes, it is like greeting an old friend, absolutely – but terrifying at the same time! You played the role of Mrs Johnstone from 1997 right up until 2000, then revised it in 2008 and then again in 2012 for the final two weeks of its West End run – fair to say it’s your ultimate role? LP: Oh absolutely, without a shadow of a doubt! Mrs J is just me. 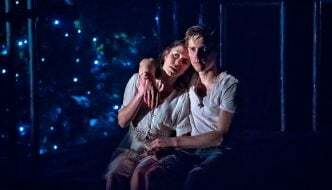 Everything that she’s going through I feel, the way Willy’s (Russell) written it is so easy to get over to an audience as it’s actually written as you would speak. Sometimes, when people write a script, you look at it and think, “well, that’s not how I would say it”. But this is so perfectly written and so easy, it just flows, and I just feel that Mrs J is me, so it makes it very easy to play. A lot of people will also know you as a member of the New Seekers and singing that well-known, world-famous song I’d Like to Teach the World to Sing, but can you clear up my confusion over it – did you record it for Coca Cola or after the ad came out? LP: We recorded the advert first for Coca Cola and then everybody said, “wow, that’s a fantastic song” although the five of us just looked at each other and said, “what?” (laughs) But everybody turned out to be right and we went into the studio and recorded the single and the rest is history. And it crops up all the time. It was in the last ever episode of Mad Men too, it was a perfect way to end that show and a very proud moment for us too. 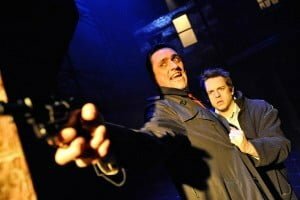 Blood Brothers is a very moving show, have you come across any fans that have told you how much it has touched their lives and stayed with them? LP: I got a letter once from a woman who had a son who was in jail, and she said she sat watching it and it was the only time she’d ever seen anybody portray on stage a jail sequence that is exactly as it is. And she said she cried and cried. So if that’s one example, can you imagine how other people must relate to other parts of it. Everyone’s gone through highs and lows and a lot of what Mrs J’s gone through. And Mrs Lyons. And Mickey and Eddie. SJ: Yes, and I’ve been going to the gym every day to try to keep myself in shape. This cast have been together a while now – do you have to rehearse as much as a new company would? Bet you can play this part in your sleep! SJ: I think because we’ve had a four month break we’ll probably have a couple of days rehearsing, but I doubt it will be very intense. We’ll get half an hour in and remember it all. Now you’ve been playing the part of Mikey for more than 15 years! How did it all begin? SJ: I’ve been in the show for 16 years on and off and been Mickey for 14. As for the character, it’s basically me but with drug addiction and jail terms thrown in (laughs). It’s very similar to myself, actually, I was expelled from school. 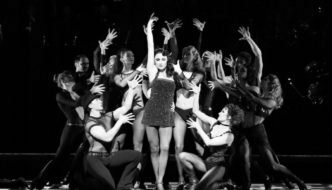 When I first saw the show, it was because someone had said to me, you should go and see the show because there’s a part that you’d be right for. And when you’re a young actor you want to know what to market yourself on. So I went to see it, and it’s set in Liverpool which is just down the road [Sean is from north Wales] and I thought, “I get this”. 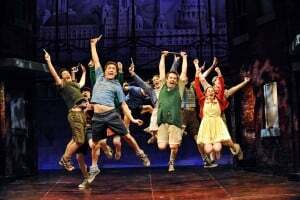 The only downside of it was that it’s a musical and I’m not very musical theatre, I didn’t train to do musical theatre, had never done a day’s dance class in my life. SJ: Well, it was very random, but I had this really crappy agent and they kept putting me up for these musicals and I actually started walking out of auditions because I hated singing. And finally, this agent said to me she’d got me an audition, and she said to me, “don’t be cross, it’s another musical.” I moaned but she said, “hang on, it’s Blood Brothers.” And she knew I was obsessed with the part of Mickey, but I never thought it would be something I’d be trying out for. She then told me the audition was for the part of understudy to Mickey and I thought, oh s***, I’m going to have to go for this, aren’t I? So I learned a song and went in and I thought, you know what, I’m in the producer’s office and I’m just going to go for it. And I really didn’t think I’d get it, I was shocked to get a recall and thought that was as far as I would get but then I got the understudy part! I understudied for two years and there was a tour going out on the road and begged to get another chance to audition for Bill. Eventually I did and I got it! And in this job, it’s very rare that you get to play a part that you want to play. SJ: So it’s the story of twin boys separated at birth and one stays with his working class mother while the other one is given away to a rich family, and that’s the story in a nutshell. The characters are growing up in 1960s and 1970s Liverpool and all that pertained to politics and class divide. I suppose it’s an examination of nature versus nurture and how nothing goes right for Mikey, he gets expelled from school, he goes on the dole because of the unemployment situation at the time, while his twin brother who was given away has a great education and goes to university, but fate keeps pulling them together and they become really good friends. But as they get older, the differences between them become more stark. You play Mickey as a child and then as a grown man – how do you manage to plays those two different generations so well? SJ: First and foremost, it’s the writing. Willy Russell has written the part of a seven-year-old boy perfectly, he really understood what the essence of playing that age is, so I think the writing primarily helps. But then also in Bill and Bob (Tomson) directing it, they won’t just let you put on a silly, childlike voice and walk like a kid. What they want is to find the essence of being that age, because the whole thing about the audience is to have them suspend their disbelief because it’s storytelling, it’s make-believe. 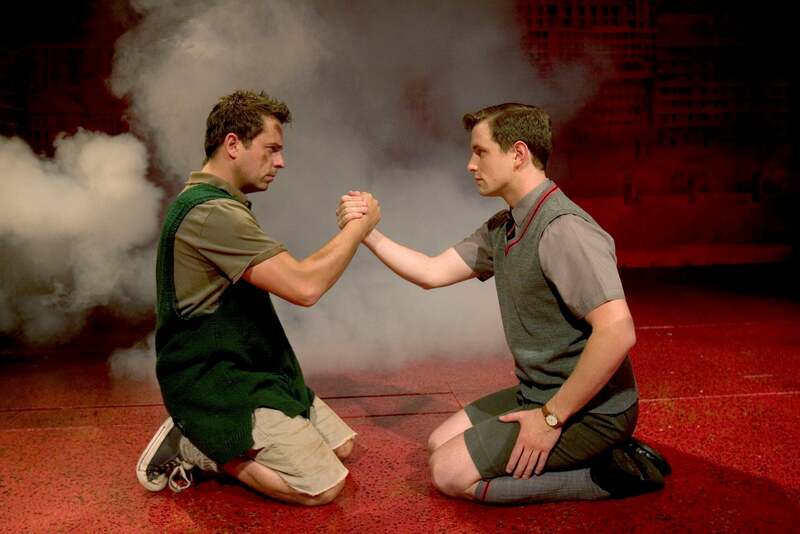 So in as much as a kid can put on show for you and pretend to be adults, it’s the same with Blood Brothers. I run on stage in a baggy jumper and I sit on the edge of the stage and tell the audience I’m seven-years-old and they’ll accept it. As long as I am giving the right amount of energy then they’ll just go along with it. They get so engrossed in the characters they forget they’re watching adults. 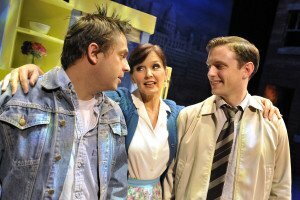 Blood Brothers comes to Leeds Grand Theatre on 28th March – 2nd April. Don’t miss it!